Vintage Darracq and Perry motor cars at A.C. Penman of Dumfries. Homepage. This page: Two invoices detailing work done to two vintage cars by AC Penman at the Queensberry Motor Works. Repairs to a Darracq and a Perry car by A.C. Penman of the Queensberry Motor Works. 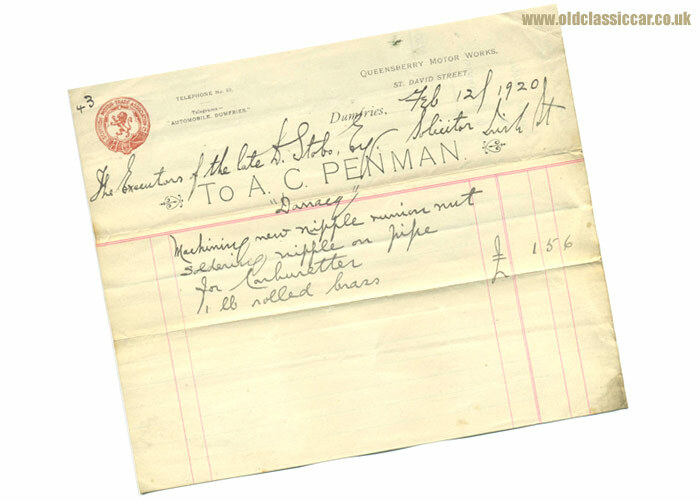 Both of the invoices that feature below were issued by A.C. Penman, a motor engineer working out of the Queensberry Motor Works, on St. David Street in Dumfries, Scotland. Both invoices were issued to the executors managing the estate of D. Stobo (or D. Stoba) Esquire, following work done to motor-cars after his passing. The invoice dated February 12th 1920 refers to minor repair work done to a vintage Darracq, which involved making up a new piece of pipework for the car's carburetter. Total cost for the work: £1 5s 6d. A logo for the Scottish Motor Trade Association features to the top left of Penman's paperwork, as does information on his telephone and telegram contact details. The Perry Motor Company commenced production of their two-cylinder 8hp light cars in 1913, from their works in Tyseley, Birmingham. This followed successful trials of two prototype cars in the years leading up to introduction of an official model. In 1914 an 11.9hp four-cylinder car was introduced (which after the firm's demise would go on to form the basis of the first Beans). Production ceased during the Great War, with the company being formally wound up and its assets sold off in 1918. Prior to getting involved in car production, the company had concentrated on the manufacture of pen knibs, and later cycles and cycle accessories. The invoice dated March 16th 1920 refers to work done on the gearbox of a Perry, specifically dismantling and overhauling the 'box which had required a "... new gear and shaft ...". Total cost for the work was £6 16s 0d, this included 6s for the carriage of the parts to Penman's workshop, presumably from the Perry factory in Birmingham. Which model of Perry the work was done to isn't recorded unfortunately. A.C. Penman and the Queensberry Motor Works. Records advise that the firm of A.C. Penman Ltd, started out as a business building horse-drawn carriages formed by J.B. Penman in 1856 at Fleet. In 1866 the firm re-located to Castle Douglas. Penman's son, A.C. Penman, was employed as an apprentice. In 1887 the latter formed his own company in Dumfries which, with the rising popularity of the motor-car, later diversified into the production of coachbuilt bodies for car chassis. 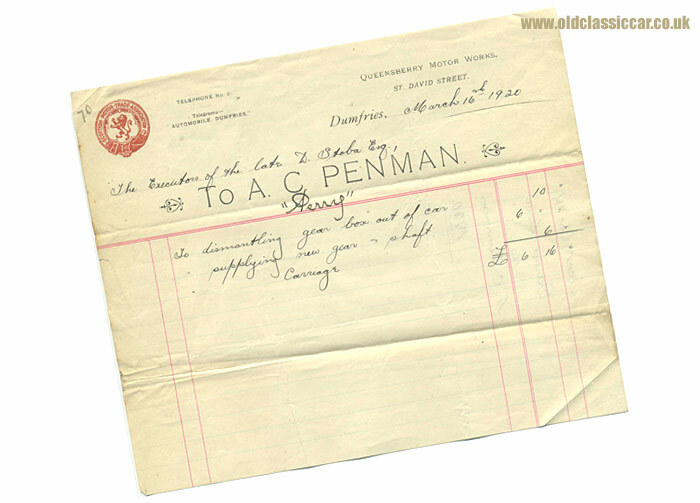 In 1920 the two firms were amalgamated, and A.C. Penman Ltd was formed. As the invoices above make no mention of this being a limited company, they must just pre-date this change. The firm grew over the coming decades, also taking on the build of commercial vehicle coachwork, and in the 1970s/80s were involved in building armoured vehicles, from their facilities in Locharbriggs. An example of their early work, a landaulet brougham body they named the "Queensberry", fitted to a 14-16hp Albion chassis, can be seen on this other site.